Shana Davis, owner of LV Dog Resort, grew up in Las Vegas just a few blocks down from our West Sahara and South Rainbow location. After completing high school, Shana attended UNR for a few years preparing to become a veterinarian due to her love of animals. Ultimately, Shana transferred and graduated from UNLV in order to be closer to family and home. After graduation, she began a separate business but soon realized that animals remained her great love in life (at the time, she had already saved 5 chihuahuas from less than ideal situations). During the years after college, she would do everything possible to help save any dog that she came across whether that meant: adopting them herself, helping to locate the owners of lost pups, or helping in the search for a loving home. Shana flew out of town to go on a family vacation. She had never left her dogs at a dog boarding facility. “I had heard the stories about dog boarders and didn’t want that for my babies.” At the time, she only trusted her vet but knew that it still wouldn’t be the best situation. After a few days, Shana, who could no longer bear the thought of her dogs staying at a safe but secluded area, cut her family trip short to care for her 5 chihuahuas. There had to be something better! Having had great success with her initial business, Shana decided that it was time to pursue a new venture that she felt absolutely passionate about. At this time I decided to buy a dog boarding facility and make sure that people could go on vacation and visit family and not worry about their babies being cared for properly while they were gone. I looked at every pet hotel and kennel in Las Vegas as a potential start. After looking at every facility I concluded that none of them were what I felt was needed in our community. After realizing that in 2009, there weren’t any adequate dog boarding or pet hotels that could truly care for each guest as if they were their own, Shana started LV Dog Resort. Big spacious and comfortable suites were at the top of the list because she knew that there was no way that a dog could enjoy staying at a boarding facility locked up in a cage most of the day. It has taken Shana 5 years to build such an amazing staff where each and every staff member are extremely loving of dogs and animals in general. Our staff love dogs so much they each have at least 4 of their own at home. The reason I feel I have been so successful in this business is because I truly care about each and every dog. I understand every dog has its own special needs. Some dogs might not be dog friendly so they need staff to play with them, exercise them, and give them love. I take the role of mommy when their parents leave them with me and I do not hesitate for one second to take a baby to the vet if I think they do not feel well. I feel like that overly protective mommy who makes sure everyone is happy, eating well, safe, drinking enough water, that no other dogs are picking on them, and that they are having fun and enjoying their stay. I am so proud of LV Dog Resort and this pet hotel and being able to pursue this lifelong dream. Once a family comes to LV Dog Resort they never leave because they realize that leaving them with friends or family, doesn’t compare to us taking care of them as if they were our own. 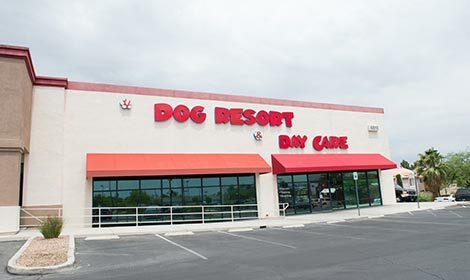 LV Dog Resort was started in 2009 by a Las Vegas family that constantly had to struggle with finding the perfect dog boarding facility for their canine family members. With so many options to choose from and price differences, it seemed that no choice would be good enough. After taking a few vacations and not wanting to leave the dogs in the hands of neighbors or friends, the Davis family finally came across 2 boarding facilities that might work. However, over time, they noticed that Boo Boo, Gizzy, Baby, and Jewel would come home anxious and almost as if they hadn’t had a fun time during their stay because they were eager to get out of there! Finally in 2009, the opportunity to start LV Dog Resort presented itself. From the start, Shana and our dog-loving staff wanted to create a pet hotel experience where dogs and their owners could feel comfortable knowing that they would be taken care of as if they were already part of the LV Dog Resort family. Our high-end luxury Doggie Suites are all equipped with flat screen TV’s for your pet’s enjoyment (you can see a gallery of our amenities here). Our facility was designed to offer your pet the most exclusive and unique experience, a perfect alternative to a caged boarding kennel. Every pet hotel guest has access to our in-door play park, with 6 large Screen Televisions showing Doggie Cartoons, Animal planet, and Jazz music during Nap times. All Guests are rotated to visit our outdoor play park throughout the day. The unique concept of providing the best possible services, luxury amenities and specialty products available all under one roof, has not only created a fabulous lifestyle for your dogs, but also for their owners. Contact us today to find out more! We had a need for day care services several times a week, due to separation anxiety. I immediately took her here. They love her and she loves it there! We have boarded her, and take her for daycare on a regular basis. They offer package deals which save you quite a bit if you board or daycare frequently. Sadie comes home very tired from playing all day, and her separation anxiety is no longer an issue! The staff is awesome, and always helpful and accomodating (late pickups, early dropoffs, etc). The facility is staffed 24/7, and is very clean. Unlimited playtime is already included with day care and boarding guests. No extra hidden fees. Play time is charged per hour. If you don’t purchase play time they just stay caged all day long.